50 million people in the U.S.—one in four children—don’t know where their next meal is coming from, despite our having the means to provide nutritious, affordable food for all Americans. Directors Kristi Jacobson and Lori Silverbush examine this issue through the lens of three people who are struggling with food insecurity: Barbie, a single Philadelphia mother who grew up in poverty and is trying to provide a better life for her two kids; Rosie, a Colorado fifth-grader who often has to depend on friends and neighbors to feed her and has trouble concentrating in school; and Tremonica, a Mississippi second-grader whose asthma and health issues are exacerbated by the largely empty calories her hardworking mother can afford. Their stories are interwoven with insights from experts including sociologist Janet Poppendieck, author Raj Patel and nutrition policy leader Marion Nestle; ordinary citizens like Pastor Bob Wilson and teachers Leslie Nichols and Odessa Cherry; and activists such as Witness to Hunger’s Mariana Chilton, Top Chef’s Tom Colicchio and Oscar®-winning actor Jeff Bridges. 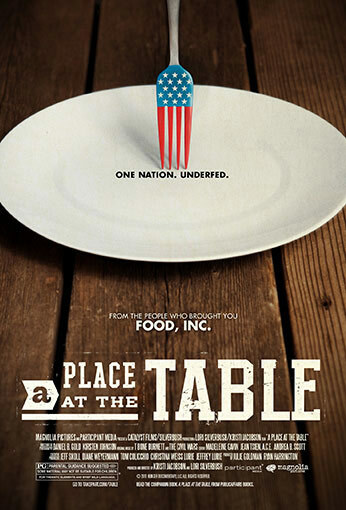 Ultimately, A Place at the Table shows us how hunger poses serious economic, social and cultural implications for our nation, and that it could be solved once and for all, if the American public decides—as they have in the past—that making healthy food available and affordable is in the best interest of us all.